I looked forward to this long weekend because I hoped to be able to devote a fair amount of time to it to art. 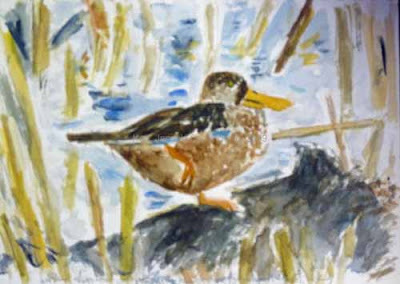 After my unsuccessful Northern Shoveler watercolors I decided I needed to spend some time doing detailed sketches of ducks. 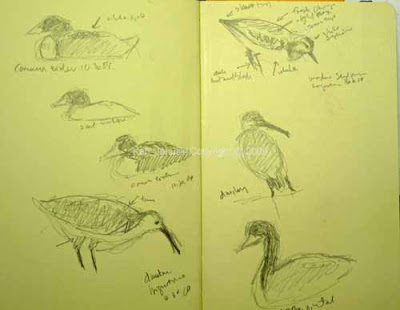 So yesterday I concentrated on Northern Shovelers. 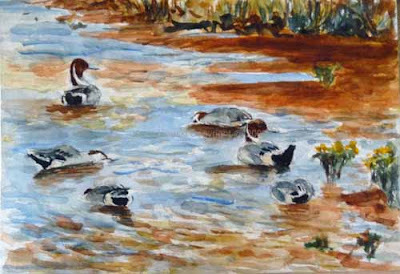 Today it was American Wigeons. 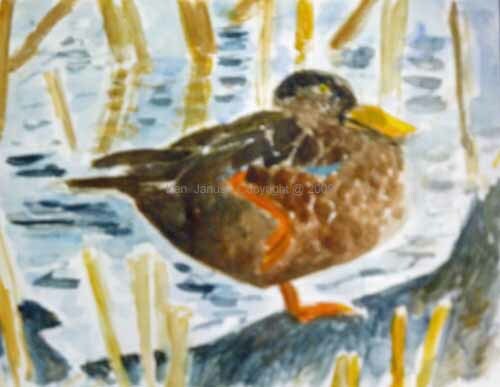 For many ducks can be dull birds. When we were at The Meadows of Cape May in October we ran into someone who was using the trails for bike riding. He had no interest in birds at all. Until we showed him some ducks magnified 30x in my spotting scope. I think he left a believer. 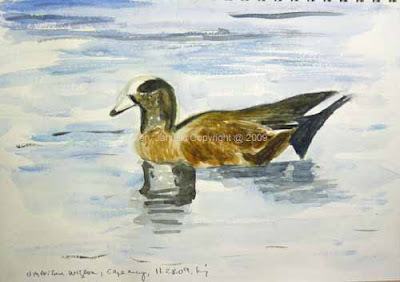 Ducks are incredibly beautiful birds, especially in breeding plumage. The one problem for an artist is that the patterns can be so complex that to render them truthfully seems almost impossible. Thus these drawings. 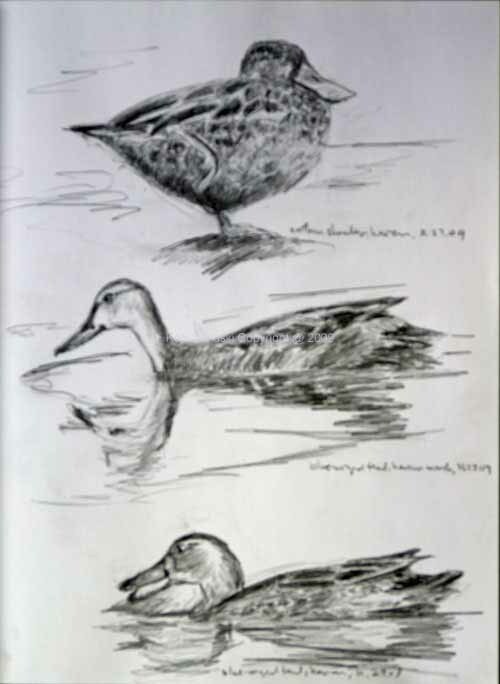 My hope is that in doing them enough I'll eventually understand both the structure of ducks, especially in regard to feather tracts, and find a shorthand for their complex patterns. Today's works like yesterday's are all based on photos that I took. With such beautiful birds it's been a pleasure to work on them. 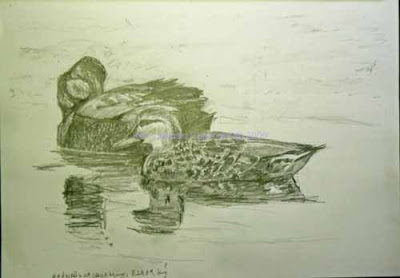 At some time, probably weeks away, I'll try to do some more developed works using ducks as subject matter. 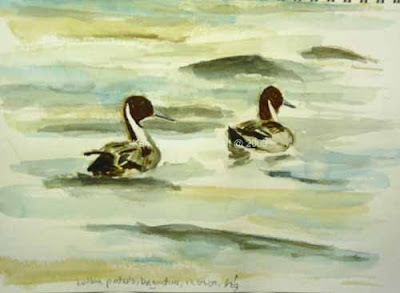 My recent watercolors of Northern Shovelers left me disappointed. 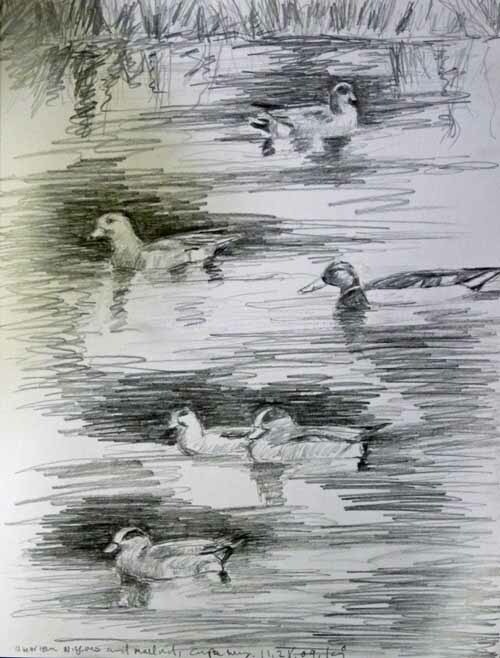 I realized that part of this might have been due to the fact that I really don't know ducks all that well, either through seeing them or through drawing them. Sometimes when that happens I have a tendency to just go ahead and paint them anyway trusting that some magical powers of the brush coupled with my past artistic experience will pull off the little trick of making it look like I know what I'm about. Sometimes it works and sometimes it doesn't. 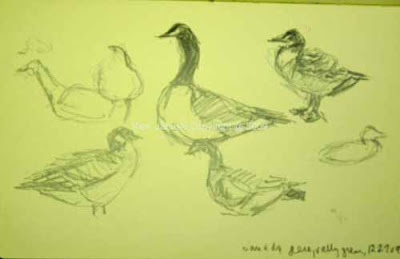 It didn't with those two watercolors so I decided to devote some time to doing detailed sketches of ducks. My hope was that it would improve my knowledge of ducks. Today's results are above. All are based on photos I took. They include the same Northern Shoveler from the watercolors in both sketches. 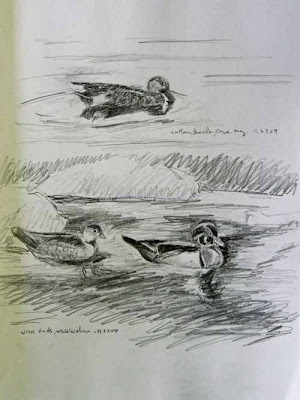 Also included are two Wood Ducks seen at the Wissahickon in Philadelphia a couple of years ago and a Blue-Winged Teal seen at Horicon Marsh this fall. As I've said many, probably too many times, I don't like working from photos. 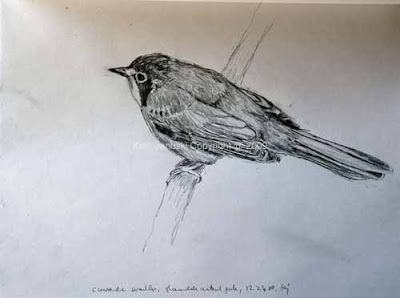 But as Colleen C. said recently on bird forum: better photos than dead birds as older artists used to use. Before binoculars, telescopes and cameras the only way to see the details of most birds was to have dead specimens. Looked at from that perspective it doesn't see all that bad. But photos are always deceptive. No one actually sees as a camera does. We see much more dynamically and our other senses at the scene contribute to the overall visual impression. Photos don't have this. So they are useful for studying detail at times, especially in the colder months of the year when it's harder to work outside, but I'd be a lot happier to be drawing them as I looked at them in my scope. Next spring, or hopefully earlier. What could be a better image of the pleasures of Thanksgiving and the vibrant colors of fall, not yet dulled down to the grays of winter, than this Jolly Jester Marigold from our garden? Normally it would be blasted by Thanksgiving but this is the first year in many where it's Thanksgiving and we still haven't had a killing frost. 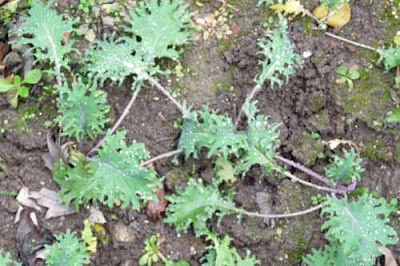 When we do get a killing frost though these Red Russian Kale should still be just fine, snugged away in their cold frame (as long as I build a top for it soon!). Meanwhile during this 4-day holiday I'll see if I can't come up with a better version of this Northern Shoveler seen at Horicon Marsh in September, 2009. 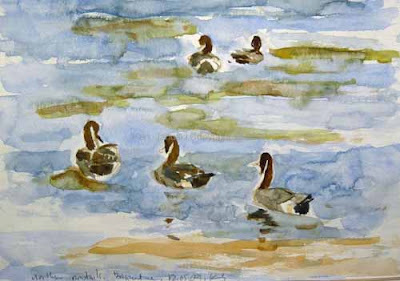 I keep getting lost in the complex feather pattern and my 15-30 minute watercolor turn to 60 minute muddycolors. I wasn't going to post these but I hate to post just photos. They look so empty to me compared to actual artwork! Watercolors really look best when they're crisp. These aren't but it remains my goal. Happy Thanksgiving! A great day to realize all that you have to be thankful for! Since last weekend's attempt to meld detailed drawings and quick watercolors I've concentrated on quick watercolors. I like them. They're fun to do and because they are quick my standards aren't as high. 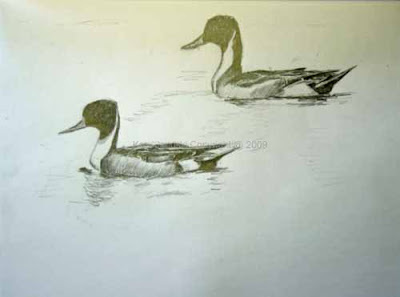 But I often want to take what I've learned from them and use it on a more developed watercolor. Today I decided to first do a fairly quick watercolor of a Lesser Yellowlegs and Solitary Sandpiper seen at Crane Creek in Ohio. I intended to then do a more developed watercolor like last week. Something went wrong. I ended up spending an hour or more doing a watercolor on paper that could never handle that much working. I'm not sure how it went so wrong but I decided it might be best to do a detailed drawing before proceeding to a more developed watercolor. But this time I decided to use my watercolor pencils. Now they've always been very frustrating to me. I thought that wouldn't be the case today because I didn't intend to use water with them. But they were still frustrating. 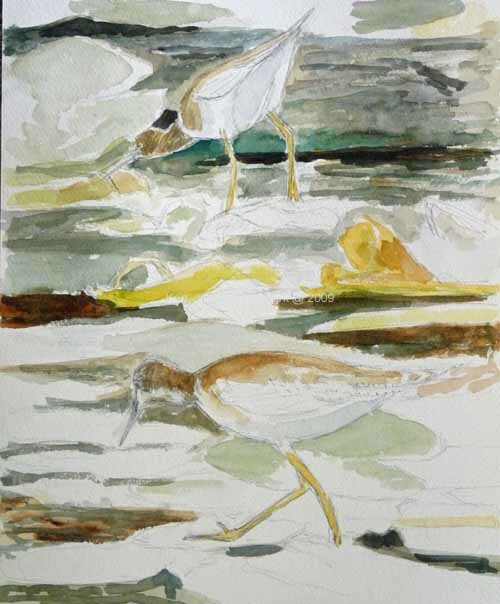 There's something about the physical quality of the pigment that makes it very recalcitrant about accepting additional layers of color, with or without water. So the results are at top. Basically the first color down is what you see, regardless of my intent for it to be otherwise. So a beautiful day for sitting in the sun working on new drawings and paintings has gone awry. But progress in art is rarely straightforward. Time to go do some garden work while we're still enjoying this abnormally warm November weather. Maybe these will look better when I come back. Ummmmmmmmmm then again maybe not. 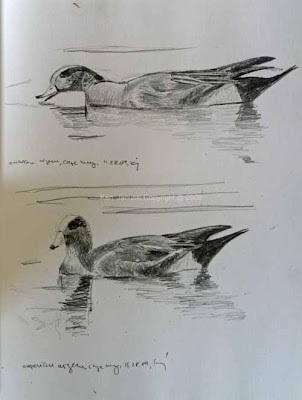 About a month ago I posted something on sketching the natural wealth of Cape May, NJ. 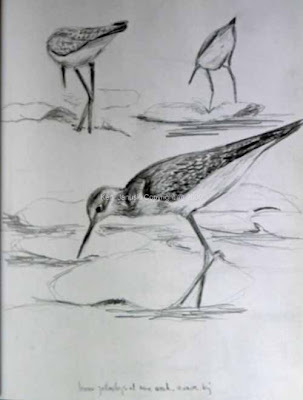 It included a lot of live field sketches of birds seen around Cape May, including the wonderful Brigantine NWR about 50 miles north. When you're done visiting and tally up all that you've seen you almost always end with: Boy I saw a lot of different types of birds! One of those birds is the Snow Goose, a bird we primarily see at Brigantine. Often we only see large flocks in flight, but this time we were lucky enough to also see some in the water and relatively close. 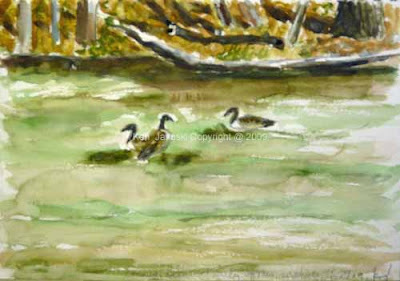 This watercolor is another in the series of recent quick watercolors. It took 15-30 minutes and is loosely based on a photo I took. If I wanted to get every bit of beauty, and detail, that is in a Snow Goose I'd be disappointed. Of course if I wanted that I wouldn't have tried such a quick watercolor on barely adequate paper. 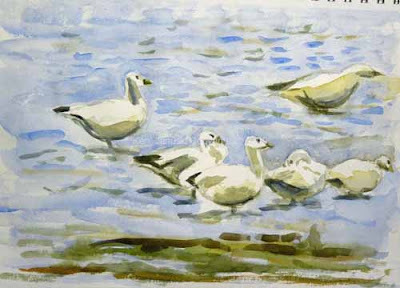 I am happy with this for other reasons: the main one being that I think it does create the illusion of Snow Geese in water. Sometimes that is the most basic pleasure of art: illusion. With materials that may be primitive, sophisticated or somewhere in between you make marks on flat paper that somehow transform themselves into an illusion of the three dimensional world. I think this does that. What it doesn't do and what I have absolutely no interest in is create the illusion of a photograph. 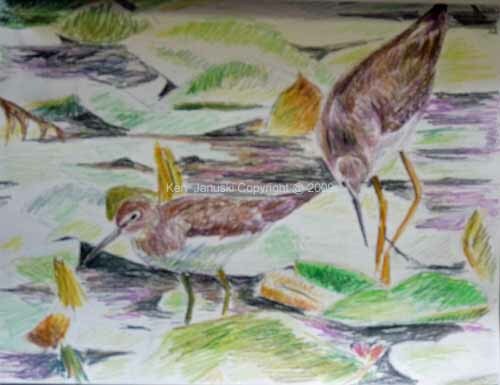 If there is one thing more than any other that has made my shy away from doing wildlife art it's the prevalence of art that imitates photos but not nature. There is a big difference, though I think many people including many artists don't realize it. For me there will always be far greater pleasure in creating an illusion of nature, no matter how basic, than an illusion of a photo, no matter how detailed. Of course not all detailed art models itself on photos, for instance Durer and his hare. But much does and to me it is antagonistic to the vitality of nature. But it does sell and this may be why more artists work this way than would really like to. This is also part of my recent training exercise of short watercolors. The purpose of that is to just get me feeling more free with watercolor so that I don't do tight, crabbed work. At some point it should lead to works that are more developed and more detailed. For now though I'm enjoying the quickly created illusion. Trick title right? Of course you paint with a brush. 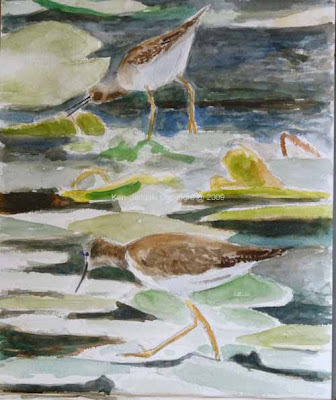 Well maybe; but one of the things that bothered me about the painting in my last post of the Lesser Yellowlegs and the lily pads was that it was a little too close to paint by number. I first drew in all the shapes and then colored them in. There was very little variety in types of brushstroke. In fact you could barely see any brushstrokes. So in a brief 15-20 minutes last night and another this morning I decided to experiment with two watercolors that were done only with a brush, including the preliminary drawing. 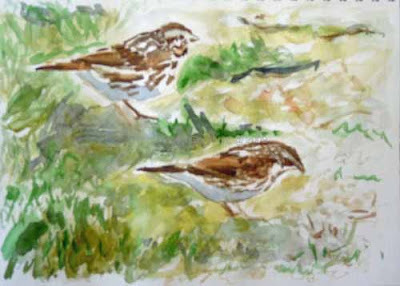 They are Savannah Sparrows, seen at Brigantine NWR in October of 2009. They are based on photos I took. My intent was to try to force myself to use the brush more creatively, to take advantage of all it could do, and not just use it to color in shapes. To a large extent I did that with the sparrows, though I did lose a lot of the detail that I'd hoped to show. But I didn't do it at all with the background. I think I should have gone for a bit more detail there and not so much impressionistic washes. Still I'm happy with them. I think it's a start in the right direction, at least for me, with watercolor. If you paint the preliminary sketch with a brush it's a much easier transition to also using the brush for shape. It's a very natural flow. I have to add that I also wanted to try this very beautiful sparrow, as so many of them are. But the detail always scared me off. For some reason knowing that I'd do it with a brush, and therefore just couldn't get too lost in detail, made it seem less intimidating. A few posts ago I mentioned that I'd already gone through too many tortured metaphors and wasn't going to add one more: subduction. Subduction is the geological process where one plate slides under another. But what slides under eventually reappears in some way, generally volcanic. This is a rough generalization so don't go taking any geology tests based on my amateurish summary. But it does strike me as appropriate to art. Much goes into the artist's wealth of experience and out it comes in some metamorphosed form. I mention this because I've done a lot of detailed pencil sketches recently as well as some very short and blunt watercolors. 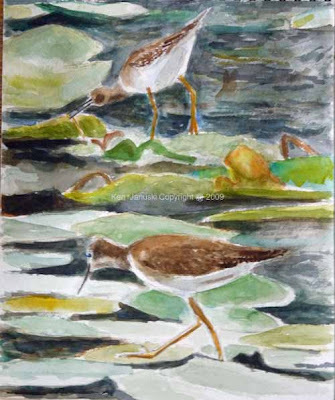 The newest watercolor of a Lesser Yellowlegs tries to blend these two together. I'm not sure if it's done and still need to look at it some more. 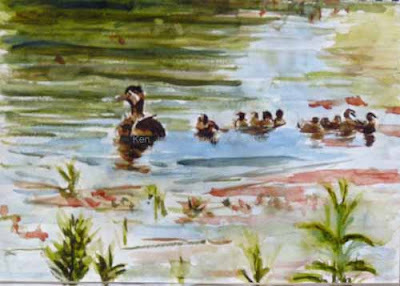 My intent in it was to have some of the detail and realism of the skecthes while also making it a lively watercolor painting. I'm happy with it in many ways but also know all the parts that I'm dissatisfied with. I still need to decide whether to go back into it or to just spend that energy on a new painting. I'm also including a few examples of different stages in the painting, going from the very earliest to the next to last. 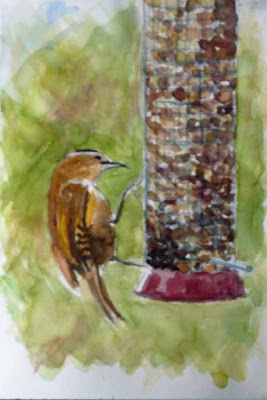 As I've mentioned a few times over the last 3-6 months I spend a lot of time at the Wildlife Art section of birdforum.net. 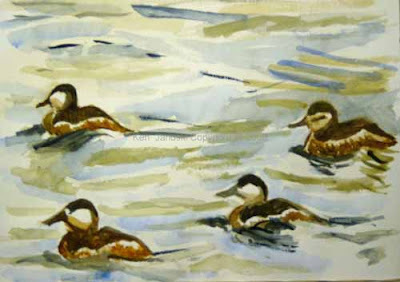 There are a number of bird artists/just plain artists there whose work I greatly admire. I've also gotten more exposure to some artists, especially British, whose published work I admire. The problem is that though their books are available online most come from England and the shipping is steep. I've had a hard time finding their work in the U.S., especially as new books. But this week I started poking around Abebooks and found many of their works available used in the U.S., for very reasonable prices. Yesterday I got two of them. 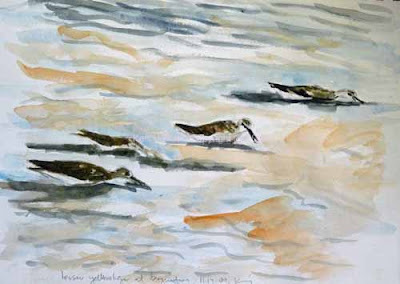 One, Birdscape, by Bruce Pearson and Robert Burton really struck me in terms of this blog. The authors visit, and Pearson draws and paints, six of the best birding spots in Great Britain. What struck me, outside of the quality of his work, was that there is little information on how he goes about painting, or even what media each illustration is in! This is in stark contrast to this blog, where I've deliberately changed to include more information about technique and less about subject over the last six months. I realize in doing so I may be losing readers. But I also know that I know more about art than about nature. Nonetheless the Bruce Pearson book has given me something to think about! So eventually I may put in a little less about my technique and process. That said I do want to explain the top watercolors. They show Greater Yellowlegs seen at Brigantine NWR in October, 2009. All are based on photos. 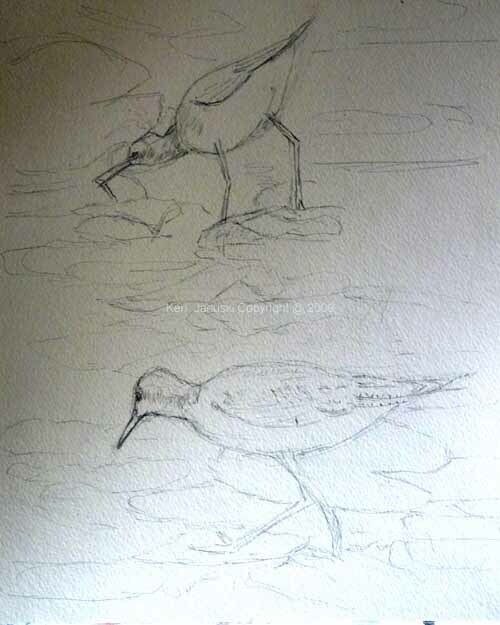 The top one was done in about an hour and tries to combine some of the detail of my recent sketches with the spontaneity of very quick watercolors.The next two were done in 15 minutes, not counting the 5 or so minutes sketching in the birds. My intent was to force myself to work quickly, as in the recent Sora watercolor, so that I might be a bit freer with watercolor. All are done on pages from an Aquabee Super Deluxe sketchbook. I used it because I'd been told it was good for sketching but could also hold some water. And that was true. It buckled a bit but not a badly for sketchbook paper. For me watercolor remains a difficult but still rewarding medium. I plan to do some more of these timed watercolors. I hope that the combination of detail in the recent pencil sketches and looseness of the short watercolors will eventually meld into a pleasing and successful whole. 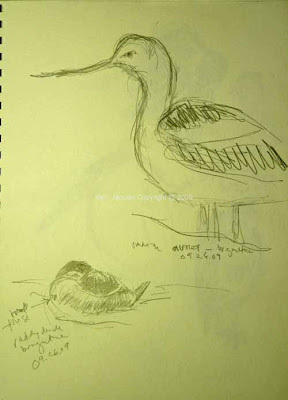 Above is my last Lesser Yellowlegs sketch. It's so odd to move from the precision of it to the imprecision of watercolor. But eventually I'm sure it will all come together. In the meantime I'll look at artists I admire, like Bruce Pearson, Lars Jonsson, Tim Wootton and Nick Derry. I took a whole lot of photos of Lesser Yellowlegs at Magee Marsh NWR back in September of 2009. 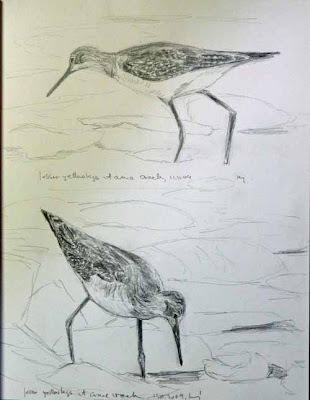 My problems with identifying two shorebirds that I thought were just one are detailed here. One of the consequences of trying to ID the bird at the same time we were trying to hurry to get started on a long drive meant that I took many, many quick photos. Now they are serving as a wealth of material for sketches. I grabbed 30 minutes this morning and then again tonight to do the two on this page. Slowly, slowly I'm learning something about the structure of shorebirds and yellowlegs. It's of course easy to be seduced by their complex feather patterning, especially if you have fairly detailed photos as I do. I'm going to need to watch out for that as I continue this process because it's very easy to get lost in that feather detail and completely mess up the overall structure of the bird itself. These two in particular gave me trouble with the placement of the legs. But I'm getting to be more familiar with these birds. 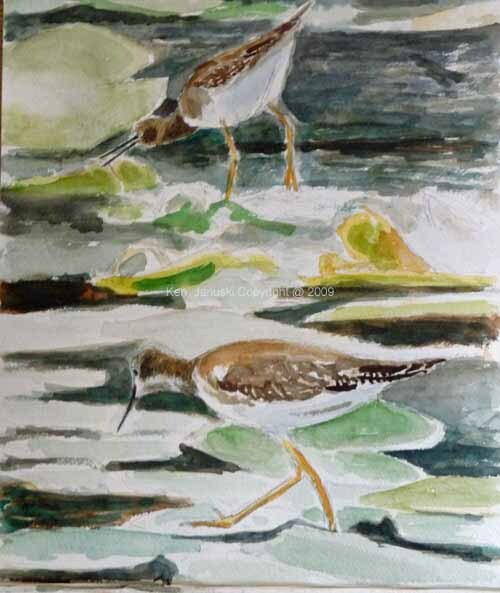 Maybe another 10 sketches and I'll start to feel comfortable enough to try another painting of them and the Solitary Sandpiper that we saw at Magee. Finally, how often to you get to write "a few more lesser" as I did in the title? Life is full of small pleasures! I suppose it's watching the Phillies in the World Series recently that caused a metaphor about varying your pitches to spring to the front of my mind. A successful pitcher needs to have a variety of pitches, e.g. fastball, curve, slider, that he uses to keep a batter off-stride thus preventing him from hitting the ball solidly. Of course the purpose of art is not to throw either the artist or the viewing public offstride. But I've always found that I'm reluctant to continue in one direction for long in art. So yesterday I worked in watercolors. I set a time limit for myself and thought that this might help me to become freer with watercolors, to have them become more natural to me. So I could just pick up and start a watercolor without thinking about it. I was happy with the results. So what did I do today? I started doing fairly detailed pencil drawings based on photos from Crane Creek and Magee Marsh NWR in Ohio this September. This wasn't due to some perverse motivation on my part. Nor was it , at least I don't think so, the fear of continuing with the method of yesterday. I really can't explain this. It's always seemed natural to me to approach art in a sideways method. Never go straight for your target - the best art. Instead go off at a 45-degree angle in one direction, then still going foward off at 45 degrees in a different direction. Sort of like moving a heavy piece of furniture across the floor. Does it make sense? Is it smart? I don't know. But it's what I prefer to do. In any case here are today's results. I stopped when I realized with the last drawing that I was losing patience with trying to draw some of the detail of the feather patterns. But I have faith that all these various methods of working at art all help to move art forward. Everything you do and everything you learn eventually leads to better art. Somehow it all gets amalgamated. I've already stretched too many metaphors so I won't say anything about the subduction of the earth's crust! 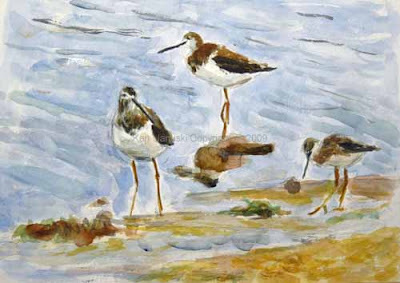 Tim Wootton over on the Wildlife Art section of Birdforum.net recently posted a link to Joseph Zbukvic, a watercolorist who works at blazing speed. 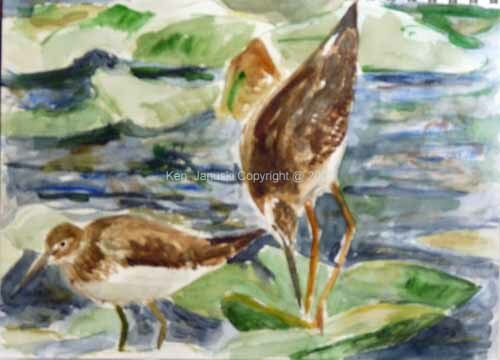 As I watched the video clip I was amazed at his facility with watercolor and brush. He says all you need is "faith." Well yes, but that faith only comes I think, for most people, with some confidence in their abilities, a confidence generally won through hard experience. At the same time watercolor looks so good when it is done quickly and not muddied and belabored. On the other hand there are some watercolorists for whom I'm sure that this is blasphemy. They do great detail over many, many days, letting the paper completely dry before doing additional work. As I was thinking about this it reminded me of most basic recipes for cooking squid: you either cook it over a very high heat for just two minutes or so, or you simmer it over a low heat for 30 plus minutes. So the same food treated very differently, both with excellent results. But the important cooking and art lesson here, is that in-between just doesn't work very well. I know! So I decided to force myself to start doing some quick watercolors, often with a time-limit. 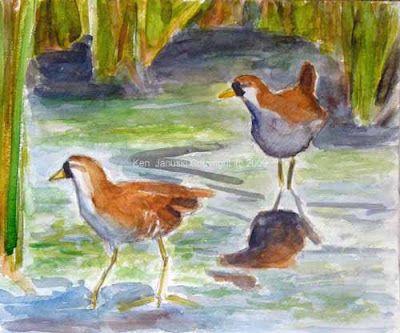 The 14x17 inch watercolor above of two soras is an example. 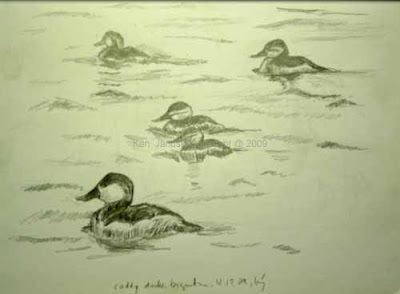 It's based on sketches and photos of the soras we saw at Horicon NWR in September, 2009. The sketch above is one I did in preparation for the watercolor. I then spent about 15-30 minutes drawing something similar onto the watercolor paper. Then I made myself work quickly. I had thought about 15 minutes but that was way too short. 60 minutes seemed about right. It allowed me to let the paper dry a bit when it needed to but also prevented me from getting too detail oriented or too tight. The ticking clock kept my brush moving. I think I'll do some more of these. I'm happy with how this turned out. There will always be some things that I'd like to repair in such paintings I'd guess but there's also much that can be learned by working quickly. The important thing is bright fresh squid, not overcooked, jaw-breaking, rubbery stuff! 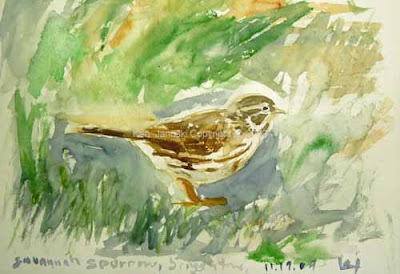 That same discussion on birdforum.net forced me to go look at my ancient textbook on Chinese brush painting, itself based on the 17th century Mustard Seed Garden Manual of Painting. But that's a story for another day!! 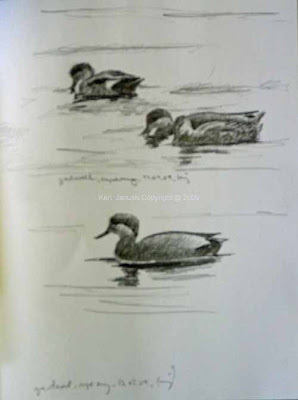 Just over a year ago I posted something on the pleasures of birding. It was illustrated by photos that I had just taken while on vacation in Cape May, NJ. But something bothered me about it. I had average looking photos. I would have preferred sketches drawn from life. 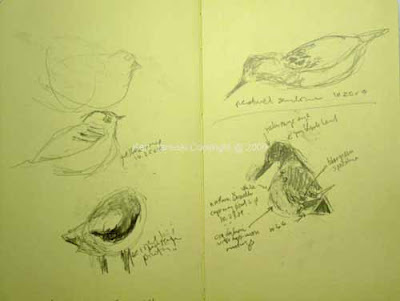 This year I'm happy to say that photos are out and field sketches are in! Combining a new scope, for better viewing, and a determination to do more sketching from life I was finally able to come home with a fair number of sketches. 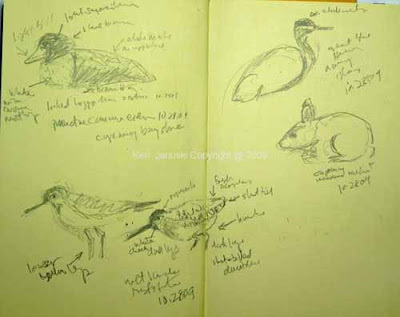 As field sketches go they could be better. 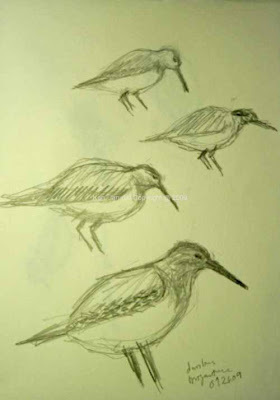 We saw over 1000 Dunlins and yet I don't think I have one really good sketch of one. But with fieldsketching you really need to keep at it. 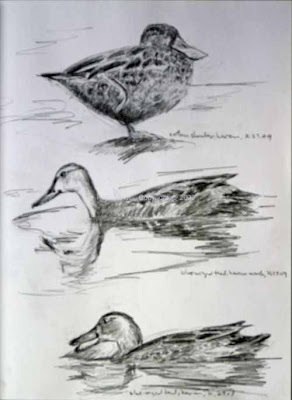 The top sketch shows a Common Eider seen near the Delaware Bayshore in Cape May, a Lesser Yellowlegs next to a Short-billed Dowitcher from The Wetlands Institute in Stone Harbor, a Great Blue Heron seen on Nummy Island, and an unidentified rabbit seen at 'The Meadows' in Cape May. 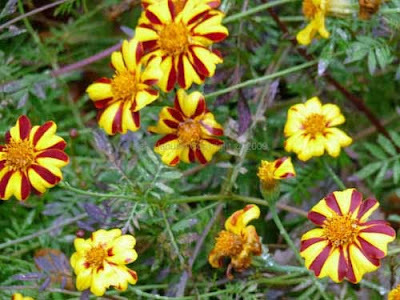 The variety is indicative of what can be seen here. 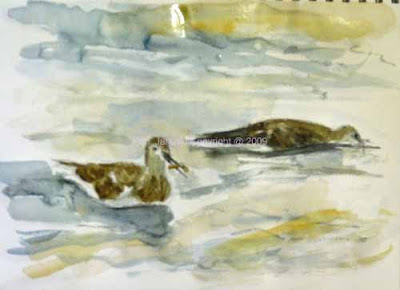 More Common Eiders above, a bird we'd never seen before, along with a Western Sandpiper, a couple Dunlins, whose bill I never got quite right, and a Northern Pintail, which were both handsome and plentiful. 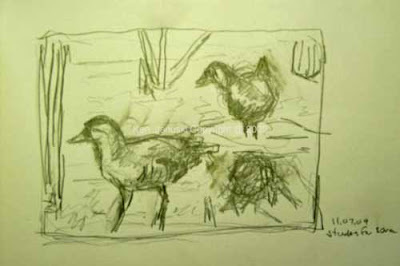 I do wish that I'd gotten more detail in my sketches but I think that will come with time. The lack of detail above takes away a bit from the Peregrine Falcon which landed at the top of a conifer just as we were heading back to our car at 'The Meadows' at Cape May, and a Merlin seen at the Bayshore in Cape May. 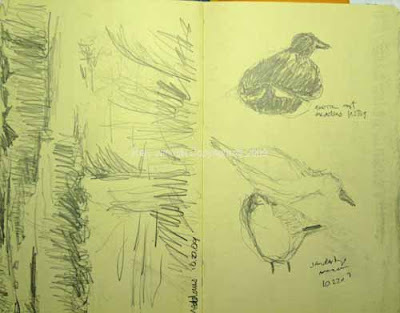 Also shown are a Hooded Merganser and a Sanderling from 'The Meadows' and a Ruddy Turnstone from the Bayshore. 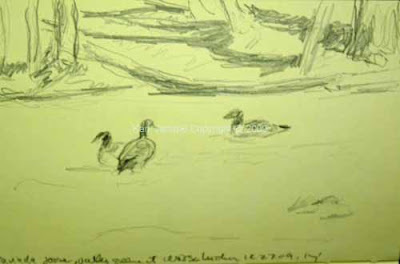 American Coots appear in the two sketches above. One shows white spots on their rumps which I'd never seen before. One was seen at 'The Meadows', and the other at Cape May Point State Park. In Cape May and I think on many birding trips a short hike often takes hours if you see a number of birds. Such was the case with our hike at the State Park. 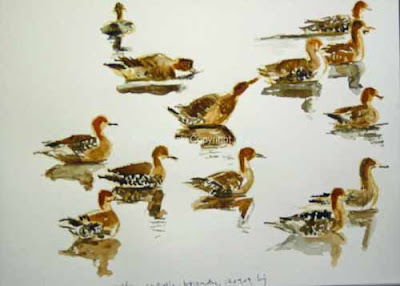 There we also saw numerous American Wigeons, shown above, and a number of Ring-Necked Ducks, which were the first we'd ever seen. 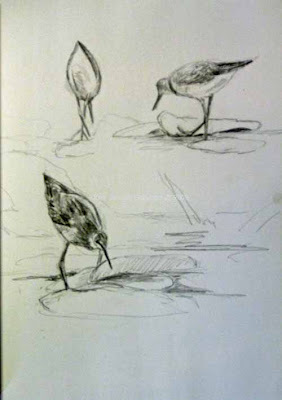 We also saw a number of Sanderlings along the Atlantic Ocean part of 'The Meadows.' 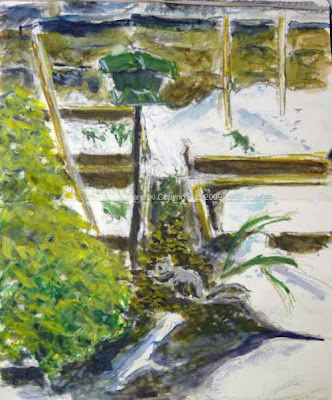 The other drawing is a landscape that might serve as background for more developed work. One other treat to see, this time at Brigantine, more formally known as the John Forsythe National Wildlife Refuge, was an American Avocet. 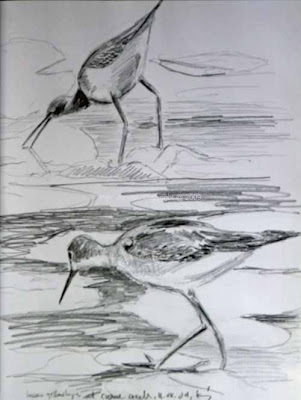 He was situated in the water in such a way that his legs were almost completely underwater so that he looked more like a duck than the long-legged Avocet. But once he was in the scope there was no doubt as to what he was. 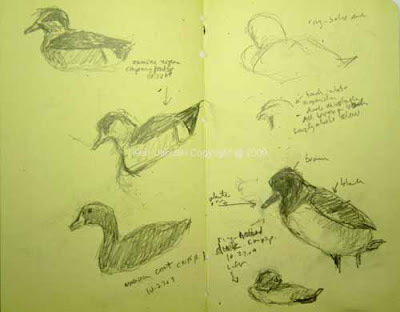 He is in the sketch above along with one of many Ruddy Ducks that we saw at The Brig. 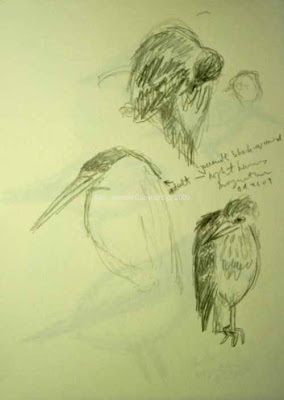 Another surprise at The Brig were a number of Black-crowned Night Herons. Most were immatures with just one adult. They also hid themselves among the shrubs so that at first you didn't see them, except for one immature who was out in the open preeing himself. Both the adult and the preening immature are shown above. The adult is incomplete because he was so buried in the vegetation. As I said earlier there were at least one thousand Dunlin at Brigantine on our first visit. And yet I just couldn't get a drawing that seemed right. 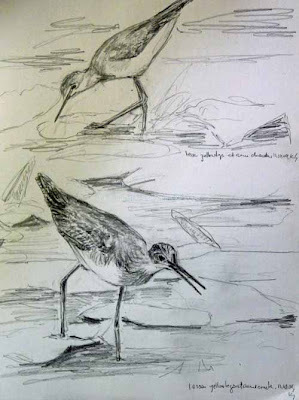 Part of this was due to the fact that they were so actively feeding, their head pointed down, bill constantly prodding the mud for food. 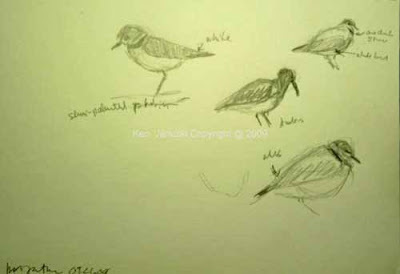 The sketches above show some of my many attempts to get a good Dunlin drawing. I also did take photos so at some point I'll take a look at them and probably do a more developed work, based on both photos and fieldsketches, that does a better job on them. 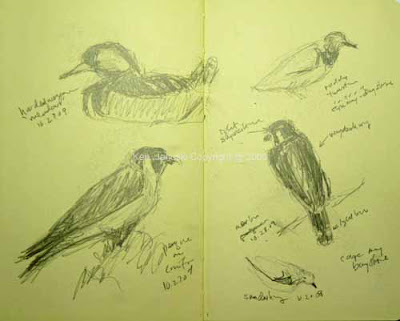 The virtue of fieldsketching, as I've said before, is that you learn how much you don't know. And then you set about learning it. There continues to be something exhilarating about this. The last two sketches above show a Yellow-Rumped Warbler, a Northern Pintail preening itself, a brief glimpse of what I thought was a Pectoral Sandpiper, a Northern Shoveler, some Semi-palmated Plover, and, of course, another Dunlin. I apologize for the quality of the photos. It's been dark and gloomy since we got back to Philadelphia and the natural light has been nearly nonexistent. But even the dark photos I think indicate just how rich birding, and nature in general, are in the Cape May area. I and my wife both feel very fortunate to live so close to it.